This look returns to the catwalks year after year and never fails to inject the perfect amount of glamour into any prêt-à-porter (ready to wear) look. 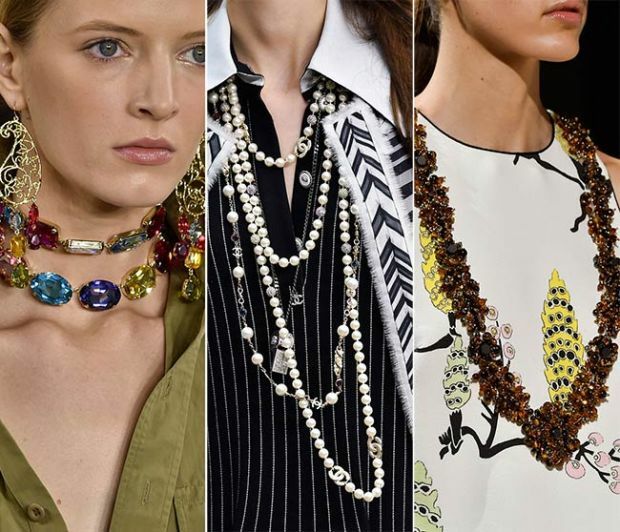 Designers often use this versatile jewellery look to add a pop of colour into monotone outfits. The key to this look is to remember that the right jewellery can 'lift' an otherwise plain, everyday outfit and completely transform it. Pick one part of your body to accentuate with jewellery, then keep the rest of your look fairly simple. As an example, you could experiment with wearing a couple of beaded necklaces that are various lengths OR large chandelier drop earrings that contain multiple gemstones. Don't be afraid to experiment with colour, with so many different gemstones now on the market you are well and truly spoilt for choice. A handy tip: Use your hair and eye colour as a guide when buying gemstones, the aim is to make your natural colouring pop!